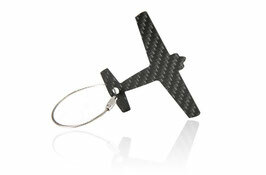 Bag Tag made out of carbon and steel cable. Handmade in germany. THE TAG BY 8R combines the precision of aviation with simple design. The carbon makes the elegant product very strong and resistant which defines it as perfect travel buddy for every occasion. It is attached by the high quality steel cabel which is as felxibe as tearproof. An eyecatcher handmade in germany.